I’ve been in the sign industry for approx 20 years now. And one thing I never even ATTEMPTED was to be in a popular sign magazine that everyone but EVERYONE in my trade collects. This mag is called SignCraft. And it’s a big deal in my sign world. Let me fill you in why I felt I never had a chance to be in this publication. My “I think I can” career. I was an independent type. Right after high school I bolted for the back door from home with my mom’s borrowed pots and pans wanting to make a life of my own. I had just landed a full time job at a major department store which was a BIG KAHUNA deal in those days. So I knew I would swing the rent and started making my own path. I knew I could do it if I worked hard. No doubt entered my mind. I wasn’t loving it any longer, but it paid well, remember? The best days I had were when I spent time in ladie’s wear. I’d display the clothes on the floor in a way to guide your eye towards the back walls. You did this with color. But my very best days of all were when the store had warehouse sales. We could wear jeans that day and hand draw the signs. I’d make splashy graphics on all the tags and had a BLAST. Well, it was a good thing I was saving all those coins because that full time job didn’t last forever. I was put down to part time. Store restructuring. I was DEVASTATED. But I knew I could make it so I started selling Mary Kay Cosmetics on the side. And then I got rear ended. I was off work for about a year, battling with lawyers. I fought every day I was suppose to be healing but that’s the way that game is played. When it was time to come back to work, I wasn’t doing all that well. My injuries played a big part in taking it easy, so I stayed on part time and did the best I could. But there was something funky going on with that store and they weren’t saying much. I had a bad feeling it was going under, so I started looking for other work. But this time it wasn’t about the money. I wanted to be happy. Dare I look into a sign shop?!? I told myself why the heck not, and did it not knowing squat about the profession. I took a drastic pay cut and went to work for my first sign shop. I hadn’t even touched a computer before but they taught me the basics I lit up like a Christmas tree and proved to be a real go getter. And the department store? It went under. And then the sign shop let me go. Without me understanding why. But no matter. I was determined to find something else right away. And did. I landed working in another sign environment that same weekend, but this time on vehicles. With very little training, I was sent on the road to stripe vehicles. I worked on commission so if I worked hard, I earned. So I sorda taught myself and became pretty fluent at it. And did really well. And then they let me go. It was a small family run company and I really think they just wanted it to remain so. I chose to walk away and resolved to rethink my chosen career path. Sheesh.. maybe I couldn’t do this after all. And then I saw an ad in the paper. It was for a graphics class for half a year. Really?!? Well, I can do this! I mean, who’d fire me from school? 🙂 I signed up and got in while drawing in unemployment. I bit the bullet and purchased my own sign equipment and learned by day and practiced at night. I read every manual I could get from the library and eventually surpassed the sign class. I ended up teaching the class what I learned myself at night. One day I remember the instructor holding up SignCraft which I had heard of. I glanced through those glossy pages and felt, “Wow… that’s quite something to be that good!” But I told myself I could do this. My biz led to eventually me teaching at the college that taught me, plus a storefront and employee. It grew so quickly I remember my accountant’s eyes when he saw the numbers. It gave me a feeling I’ll never forget. I eventually did some travelling, meeting up with a group of great sign folks just like myself. I became part of their fray and made a lot of life long friends. And most of those friends landed in Signcraft. I really was among incredibly talented people! And I remember thinking there was no way I could ever rank high enough to land in that magazine. Know, lots more water went under the bridge at this point and others, however the most vital is when my marriage ended and I had to move with young son in tow. I was scared we wouldn’t make it. My total focus became about my son and his well being. To my astonishment, the phone kept ringing. Work kept coming. I did what I needed to in order to survive but being a single parent was a big responsibility I took seriously. So I didn’t try and win awards or anything. I just did my work so I could parent my boy. Then the big year long renovation happened to the house. After that was complete, I started playing with decorating and fired up Funky Junk. It was then I started to work part time for friend Dan. Dan is in SignCraft every month so it was rather fascinating to watch over the process of writing and photography and so forth. While Funky Junk grew, so did my confidence. Dan taught me how to work with tools and I learned to play with my camera and honed my writing skills to the point where Dan noticed all the sign related things I was making, and encouraged me to submit to SignCraft. I laughed and put it off for a good long time. But I started getting in other magazines at this point. So all I could do was try right? YES I DID!!! I landed in the July/August edition. But not really as a true blue signmaker. I got in as a signmaker that used signs to decorate her home. 🙂 The passionate loophole that created the “I know I can” magic. To read the article, you can view the actual magazine PDF HERE. 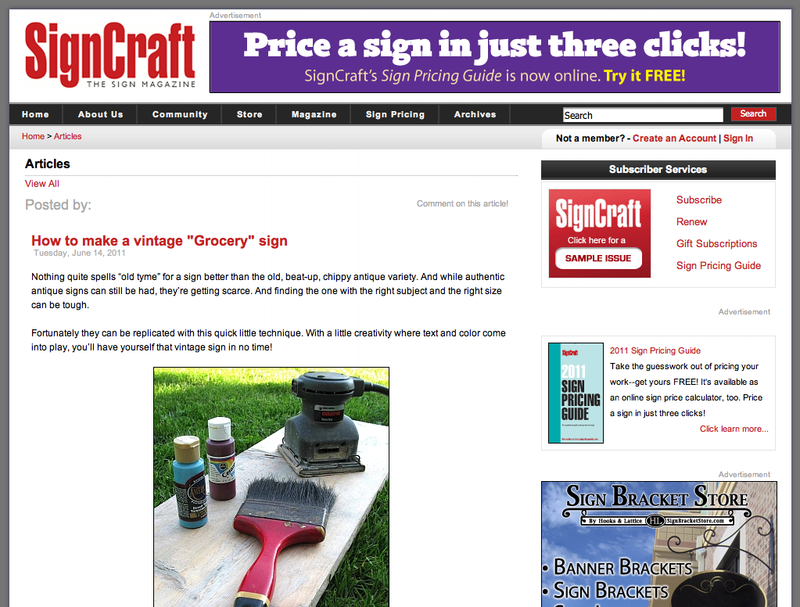 And not only did Tom give me a two page spread, they also featured an online tutorial of my Grocery sign. So how do I REALLY feel about this major feat? It’s a total honor and privilege to be among such talented signmakers in SignCraft! Thanks Tom! You think you ‘can’t?’ I challenge you to think differently. Congratulations!!! And it’s not a loophole, it’s a sign! *pun intended* lol…when someone is as good as you are, “someones” like me want to see it, and magazines like Signcraft know they must show it! It’s all about inspiration! Thanks for sharing your story. Congratulations dear Donna. What a wonderful story, one of encouragement and inspiration. It’s so exciting to see your name in print. Congratulations!!! Congratulations from one sign painter to another! Pretty impressive! Just fabulous…a rags to riches kind of story! Love it. You worked hard for it…enjoy it! Love those cute pics of you at the end!!! Wow that is great Donna! What a story, you must have been reliving the highs and lows…and it all leads to where you are now. Congrats! Congratulations! You should be a motivational speaker too! You’re a natural at changing perspective, Thanks for such an uplifting story of your journey! Congratulation, Donna! You are a true inspiration to me. Great Job! I am proud of you. God has brought you so far through a lot of hard times and His schooling. You have done well! God bless you in all you do for Him and His glory! Congratulations! 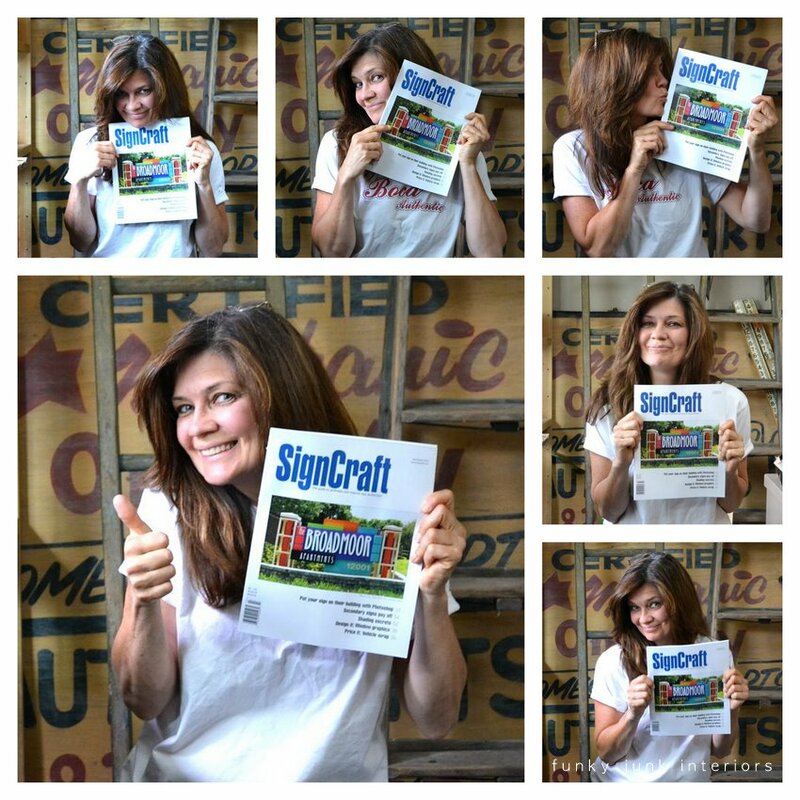 You should be very proud to be published in Sign Craft magazine. I am second generation in the sign business and owed my own sign shop for over 16 years. For the last 10 years I have been working in the graphic design and loving it. Your work is Fabulous; you go girl. Thanks for sharing. Wow!Proof that reward does come to talented people! No one can say you didn’t earn your way to fame! Congrats! You GO girl! Great accomplishment! That’s awesome, congrats! What an inspiration. my eyes!! I am so very thrilled for you!! Your work is truly AWESOME and the article looks wonderful! Good for you! You totally deserve it! Thanks for sharing your story and reminding us all that persistence pays off! Congrats Donna! It makes it that much more worth while when you know you had to work toward your goal. You are a “go getter” and that is why you succeed! Whenever something crappy happens, there’s always something better waiting around the next corner. That’s been my philosophy for the last three years and the more I say it to myself, the more it happens (and the crappy stuff isn’t happening as much anymore either!!). Congratulations Donna, you so deserve it! Such a great story, and a well deserved honor!! Congrats! Congratulations Donna! What a great story! Isn’t it amazing how one door closes and another opens! Congratulations! I happy that you’ve had your hard work and creativity recognized. You’re fabulous! AWESOME DONNA!!! CONGRATULATIONS!!! You got a wonderful spread in that magazine. You rock girl!!! You SHOULD be so proud! Thank you for sharing the whole story and letting us see the long road you have trod! Many Many Hugs and Cheers to you! congratulations! I know it is a thrill to get into other publications but to make it into the one you admire so much is a real accomplishment. I also think it is no loophole, just a different perspective. You are inspiring others to think off the wall. Yay! Donna, I’m so proud of you.I love this story and your post. It has made my day! My week. I am so thrilled to read from start to finish your wonderful story. Navigating through rough waters….wow…so glad you took the time to tell all this. I agree with the poster above me…no loophole…just a different and wonderful perspective! Awww, that’s great news! Congratulations!!! Great story, Donna. And congratulations for being in that magazine, I’m sure it’s not the last time you’ll be in there! fabulous story – great accomplishment! Congratulations Donna! I’m so excited for you! Congratulations! A much deserved honor – you’ve worked your tail off, and your creativity is always a step above. Thanks for sharing. What a lovely story! I am so happy for you! Thanks for sharing and giving me a big smile this morning! So encouraging. Brings to mind the scripture from Phillipians…” I can do all things through Christ who strengthens me”. Thanks for the reminder of that promise. How exciting! I love your story and it is quite inspirational. I try and tell myself every day that I can do this, too. It’s about time I do something that I actually love doing. Donna, it’s great to hear (read) the story of a real live person! Congratulations on the magazine feature. Very inspirational! Congrats! It is so inspiring to see someone work so hard and be validated in such a way. Bloggers like you are such an inspiration and motivation to try things I have always been too afraid of failure to try. Thank you ! Congratulations, Donna! What a major accomplishment for you!! Oh Donna, what a wonderful and inspirational story to start my day! You really should be so proud of yourself, and I’m sure your son’s proud of you too. You are setting such a good example for him. No matter how rough the road, it’s believing in yourself that makes you an all-terrain vehicle to take you anywhere you wanna go. You truly are the little engine that could! I paint home interiors (roller, faux, and murals), and according to my clients, I’ve gotten quite good at it. All of it through trial and error, along with lots of research online. Never thought I’d be getting paid for it, but when that first client hired me, I thought to myself, “I’ve never done that before, but let’s do it!”. Every time there’s a new challenge, I repeat that line. Thank you for continuing to remind me of the power of self-belief! Congratulations. Such a great story and I so enjoyed reading it this fine HOT summery day in Arizona. Keep up the good work and always remember…..you can! Have a great day. Congrat’s Donna! You deserve it! Congratulations Donna I am so proud of you… hooray for you. Good things come to good people. You have worked hard and deserve every bit of glory. Keep on truckin my friend. I have a really good feeling this is just the beginning of a wonderful new adventure. A BIG CONGRATULATIONS to you Donna! You deserve it and more! I have been a fan of your painted sign stairs for so long now….just thinking what I could do with my wood ones! Hey…..what did you ever buy with your giveaway win over at Jeanne Oliver Designs??? Congratulations!!!!! That is so awesome. I can relate a bit because of things happening with my profession…except they in no way involve my blog. The two things just don’t connect as fabulously as yours did. Way to go!!!!! Congratulations! And does it really matter HOW you got there? You ARE noteworthy and inspire others in your girl-next-door way. You go girl! WOOT WOOT!!! Way to go Donna!! Congrats Donna !!! What a great spread. Very well deserved! Wow! Congrats! It’s so great to read this right now. I just (like a few mins ago) committed to having my art featured on a prominent website and I keep going back and forth between the tears welling up and trying not to throw up! Congrats! I so love seeing your success and am encouraged by knowing you’re working hard to acheive it and I’m not the only one who has to try so hard to make it happen 🙂 Thanks for sharing your pursuit. What an inspiring story…..congratulations….you deserve the recogntiion! Love your blog! congratulations Donna ~ you ROCK! You finally kicked your train in its little caboose and did it. It all starts with an “I think I can!” said like the little engine that could. I am so happy for you. If only they could see you now. Their green envy turned into green cash for you and it has just kept going. Way to go! Now you get the last laugh on them. What a wonderful post – very uplifting and CONGRATS!!!! Thanks so much for sharing the news, but in a very personal way. You ARE very good at what you do, sign-wise as well as decorator-wise!! Congratulations!! P.S. Some of your work (& life) history sounds quite similar to some of my own too. Donna, I am so, so, SO happy for you!!! The spread is fantastic (with the very stairs drew me into becoming a fan of yours, btw). Thank you, too, for sharing your story. I’ve gone through lots of hard times (financial & more), and have been feeling a bit in the dumps this week – going through more difficult times again, sigh. Reading your story is inspiring me – I know I have to figure out a way to pick myself up by my bootstraps – and get going! Big < <<>>> to you, Donna!! oops!! That was big HUGS to you!! You are so deserving of this Donna….Your hard work has paid off and you will continue to prevail. You are an inspirtion…. This is just so stink’n cool!!!! Whenever I hear, (or even think to myself!) “you can’t”- hell or high water, I’m going to do it with gusto! Go big or go home! How very exciting for you. Congratulations. Your story has inspired me. I love it love it love it. The story, your hard work and determination, and your great success. LOVE IT! Congrats. Good for you! I think sometimes we have to go through a multitude of challenges to experience true success! I love this story Donna, you are an inspiration! Congratulations on your accomplishment! I love, love, love your blog and plan on making the groceries sign soon. Congratulations on a well deserved recognition. Your story is so uplifting and real. It is so wonderful to see your talent truly recognized in a professional way. Continued success in all you do. Big Hugs to you! What an entertaining story! I loved every moment of it. Congratulations. A well-deserved honor. Congratulations! Just found you this week and am enjoying your blog. Keep up the great work. Continue to enjoy and share your passion. 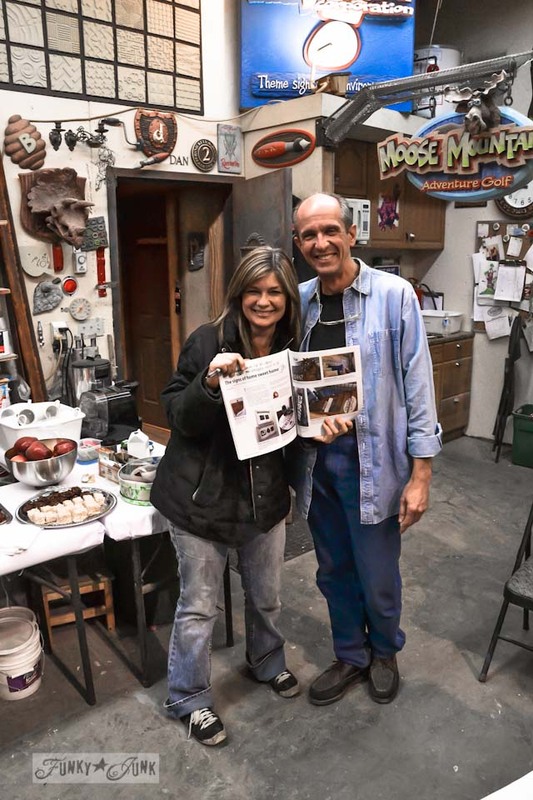 You are a treasure – so happy to have found your inspiring story. You go girl! What a great spread on you. I’m late to the party, but CONGRATULATIONS!! A big fat Yay! You did it!” to you. I’d say a little pride is in order :). Congrats!!! I’ve enjoyed your blog for quite some time. Now others can find out about you and your work in a major publication. Yeah for you. So exciting Donna, you are so cute! You have worked your bootie off and it’s all paid off! Congratulations! How exciting! Proof that working hard at what you love will bring success. FANTASTIC! Congrats Donna. Well deserved. Thanks for sharing your journey. Congrats! Hard work really does pay off. Hi Donna, I’ve read some of your inspiring posts over the past few months. Nothing sugar coated, hard working, real life, reap what you sow, genuine…and with an original style. Thank you for hosting the party. I linked up the best homemade vanilla extract to make now, for holiday giving. What a glorious testimony. I love it!!! I love this post…not sure how I missed it before! Our paths are so similar, it’s kinda eerie! Congrats on the Signcraft spread, that is the coolest!! I really enjoyed reading your story. You see you never go to work a day in your life! Keep signing and decorating your home and posting it so we fellow funky junkers can be inspired!